The former One Direction singer will perform his first U.K. gig as a solo artist at the star-studded event at Wembley Arena in London, England, on 11 June (16). But it could be that the concert marks an awkward reunion between Zayn and his ex-fiancee Perrie, who is also set to take to the stage at the gig with her group Little Mix. It would be the first time the former couple has met up since Zayn called off their engagement last August (15). They had been due to see each other at BBC Radio 1’s Big Weekend, taking place at the end of May, but Zayn pulled out. It was reported that it was due to his fear of seeing his former wife to be, with a source telling Britain's Daily Mirror newspaper: "Zayn's team don't want it to become 'a thing' if the two of them are backstage at the same time. "It will take the shine off his performance because many people would then just talk about his past relationship. Zayn and his team really want his solo career to be all about the music. Once they are both at the same location on the same day, tongues will wag. And if they were to bump into each other, it would make the whole day awkward." However, a representative of the singer denied the claims as "completely untrue" at the time. 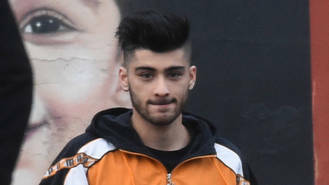 Zayn has had huge success as a solo artist since he left One Direction in March 2015. His debut solo single Pillowtalk topped the charts in more than a dozen countries, including the Billboard Hot 100, making him the first British artist to debut at number one with a first charted single. He followed that with second single Like I Would, with his debut solo album Mind of Mine hitting shelves in March (16).